OneTaq® DNA Polymerase is an optimized blend of Taq and Deep Vent™ DNA polymerases for use with routine and difficult PCR experiments. Amplification of a selection of sequences with varying GC content from human and C. elegans genomic DNA using OneTaq Hot Start 2X Master Mix with Standard Buffer. The presence of absence of an extended room temperature incubation does not affect performance. 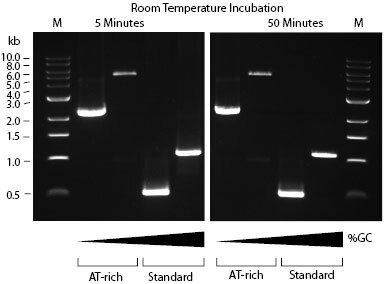 Amplicon sizes are indicated next to gel, and GC content is indicated below gel. Marker M is the 1 kb DNA Ladder (NEB #N3232 ). An E. coli strain that carries the Taq DNA Polymerase gene from Thermus aquaticus YT-1 and an E. coli strain that carries the Deep VentR DNA Polymerase gene from Pyrococcus species GB-D.
1X ThermoPol® Reaction Buffer, 200 μM dNTPs including [3H]-dTTP and 15 nM primed M13 DNA. Product specifications for individual components in the OneTaq Hot Start 2X Master Mix with Standard Buffer are available separately. OneTaq Hot Start 2X Master Mix with Standard Buffer is stable for fifteen freeze-thaw cycles when stored at -20°C. OneTaq Hot Start 2X Master Mix with Standard Buffer is also stable for one month at 4°C, so for frequent use, an aliquot may be kept at 4°C. Barnes, W.M (1994). Proc.Natl.Acad.Sci.USA. 91, 2216-2220. Saiki, R.K. et al. (1994). Science. 91, 2216-2220. Powell, L.M. et al. (1987). Cell. 50, 831-840. Sun, Y, Hegamyer, G. and Colburn, N. (1993). Biotechniques. 15, 372-374. Try using a master mix with OneTaq Hot Start DNA Polymerase to achieve highly specific and sensitive PCR amplification. Purchase of this product provides the purchaser with a non-exclusive license to use OneTaq® Hot Start 2X Master Mix with Standard Buffer for research purposes only. Nucleic acid-based aptamers for use with thermophilic DNA polymerases are licensed exclusively by New England Biolabs, Inc. from SomaLogic, Inc. (See Patent Nos. 5,475,096; 5,670,637; 5,696,249 5,874,557; and 5,693,502). New England Biolabs, Inc. gives the Buyer/User a non-exclusive license to use the aptamer-based OneTaq™ Hot Start 2X Master Mix with Standard Buffer for RESEARCH PURPOSES ONLY. Commercial use of the aptamer-based OneTaq™ Hot Start 2X Master Mix with Standard Buffer requires a license from New England Biolabs, Inc. Please contact [email protected] for more information. ONETAQ®, QUICK-LOAD® and THERMOPOL®i are registered trademarks of New England Biolabs, INC. DEEP VENT™ is a trademark of New England Biolabs, INC.
IGEPAL® is a registered trademark of Rhodia Operations. TWEEN® is a registered trademark of Uniqema Americas LLC. NEW ENGLAND BIOLABS®, ONETAQ®, QUICK-LOAD® and THERMOPOL® are registered trademarks of New England Biolabs, Inc.
DEEPVENT™ is a trademark of New England Biolabs, Inc.
Why is Tm Important in Primer Design?